You have an early morning presentation with seed investors. It is a meeting that is going to change your life. You pop into your garage in a hurry, but when you turn on the ignition key, the car will not start. You can hear the starter spinning, but it’s not engaging. The is used to start the internal combustion engine. It does this through the starter motor that has electromagnets. The battery provides the energy required to move the stator motor. Inside the stator are the pinion gears. When you turn on the ignition switch, an electrical current is sent to the stator motor. The battery has to have enough power before to turn the engine. During seasons of low temperatures, the oil in the engine is thicker, and the engine takes a while to warm up. This is the cause for starter problems during cold seasons. Current from the battery flows to the starter switch and then the starter relay. A gear system is used around the flywheel. The pinions are the ones that move the engine. Above the starter is the starter relay that when turned on causes the starter motor to move. Enough energy is required to move the starter relay. The first culprit when you are experiencing battery problems is to check your battery voltage. The battery powers the starter and if it is not working, the starter will fail. You can use a voltmeter to check the remaining charge on the battery. Set your device to 12 V and then connect the terminals. Turn on your headlights and read the voltage. A functioning battery requires 12.4 V to 12.6 V to operate the starter. Anything less than this and your car won’t start. If you are in an unsecured area, you can jumpstart your car and then later choose to either recharge the battery or purchase a new one. Next, check out whether your battery terminals are corroded. For this, you will notice some whitish or greenish substance on the terminals. You can clean your terminals with a baking water solution. Pour one part baking soda and three parts water to a bowl. While pouring the liquid on the terminals, use a brush to rid the terminals of corrosion. Rinse with water. If you do not have baking soda you can use soda – carbonic acid in soda can eradicate the battery terminals off corrosion. 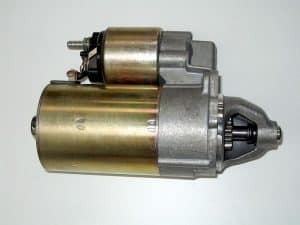 If the battery is working fine, then the problem could be with your starter motor. You will be forced to dismantle some engine parts like the intake manifold to access the motor. A faulty motor will prevent your starter from engaging. Start by checking the mounting bolts for any loose wires. The grinding noise you hear with the starter is due to a clash between the flywheel and the ring gear. Next is to dismantle the starter and check inside for the pinion gears. This is often placed at the front of the starter. The pinion gears engage the flywheel in firing up your engine. With time these gears get worn out and cause starter, not engaging problems. It is time to purchase a new piston gear if when you try to rotate it, it moves in both directions. The solenoid is located above the starter body. 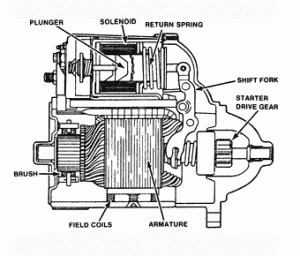 First, check whether there are any loose connections between the solenoid and starter. You can disconnect the solenoid by removing the fuel pump fuse or a thick wire that runs from the distributor cap. Use a jumper wire to ground the solenoid to a bolt. Start the ignition and listen for sounds coming from the solenoid. If the click is loud and solid then the solenoid is working fine but if you hear a weak click then recheck the wiring between the solenoid and starter. Electrical wires can with time become dirty, loose and broken. You can identify the flywheel as the large wheel that is located between the engine and transmission. The starter pinion gears engage it to start the engine. What you should be looking for in a faulty flywheel are worn or damaged gears. While the car is on neutral, rotate the crankshaft using a ratchet. The crankshaft pulley is located on the top or bottom of the engine block. As you move it watch the behavior of the flywheel. You will need to replace it if you notice that the gears are damaged. There are a few known symptoms of a starter that is not engaging. Here are some of the most common ones. This is the most obvious sign of a bad starter. When a person turns on the ignition and electrical signal is sent to the starter relay. A circuit in the starter system can be at fault, and that is why no matter how many times you try turning on the ignition it will not start. If your battery is low on the voltage you will hear a repetitive clicking sound, but the charge is not enough to power the engine. The reason for this is that the starter relay is not receiving a full signal. There are those moments that you turn on the ignition, and the engine comes to life immediately, and other times you need to turn on the ignition several times before the engine starts. The problem could be that the starter relay has accumulated dirt and other debris or it has outlived its purpose. A mechanic can solve the dirt and poor connection problems, but it could be time to purchase a new starter relay. Having a faulty starter can leave you stranded in the middle of nowhere. You will know that you have starter problems when you hear a clicking sound in the engine but notice that the engine does not roar to life. You should first check your battery power or loose wiring connections when this happens. If your battery has low voltage, then it does not have enough power to turn on the stator motor. If the battery is fine, the problems could be with the solenoid, starter relay or the flywheel. You will need to dismantle the stator motor and diagnose for problems.